Lily loves visiting my parents farm. Every time we’re there she gets to ride on the tractor and see the cows. However, this past visit was extra special. It started out with a little hay baling. Usually baling hay this late in the year is unheard of, but not this year. My dad was going to finish up one field and then off to bale some cornstalks. He asked Lily if she wanted to ride along and she was very excited. 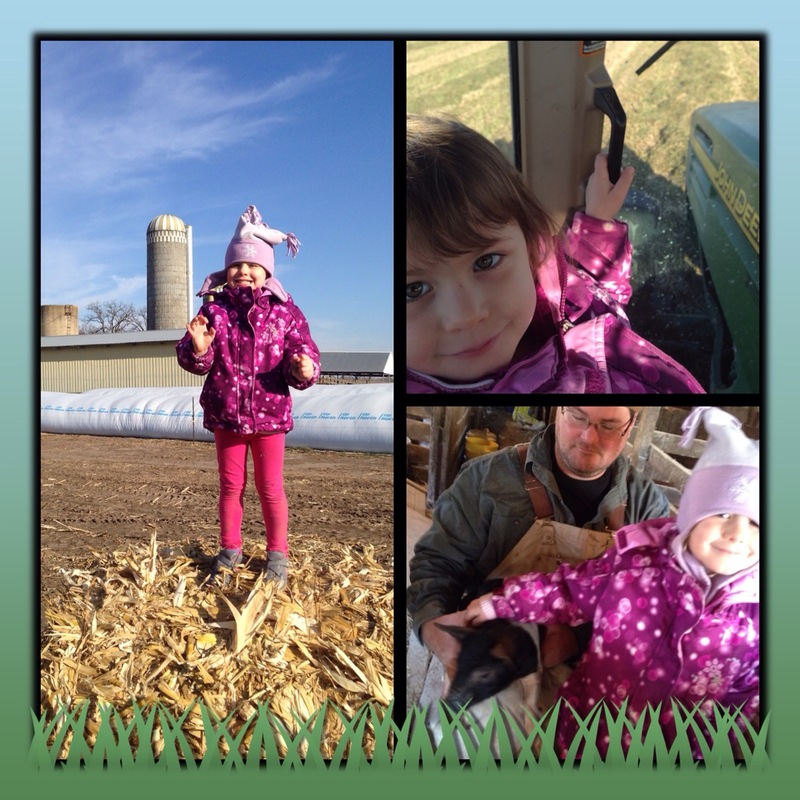 We went for a ride in the tractor, made some big round bales, and Lily talked farming with grandpa Tom. Once the baling was over, we went to uncle Tim’s house to see the pigs. There were little pigs and big pigs to pet and even some chickens to check out. Later that afternoon, uncle Tim took Lily out to feed the cows. She got to stand next to the bunk as Tim turned on the belt feeder and the cows came in for lunch. There was also a lot of play time on the farm. We jumped on bails, ran all around, went on the tire swing, and had quite a bit of fun. Grandma and Dad wore out long before Lily did, but she was ready for bed by 6pm. Turns out working on the farm is hard work even for a little girl.